RPP-875 Pneumatic Rotary Press | Black Bros. The Black Bros. Rotary Pneumatic Press model RPP-875 features larger diameter rolls in a compact frame to handle a wide range of products. Yet with 8,000 lbs or 4,500 lbs of maximum combining pressure. 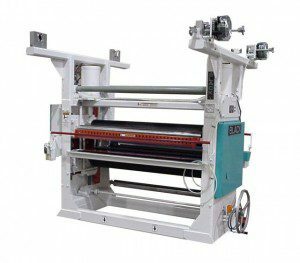 The rotary pneumatic press can tackle many continuous or single piece laminating tasks. Air cylinders provide uniform and consistent pressure to ensure quality lamination. Available from 32″ to 110″, the rotary pneumatic press can also be applicable to an equally diverse range of industries. This machine can be configured for rigid or flexible web substrates and overlays. Many foam processors find the rotary pneumatic press model RPP- 875 perfect for laminating a protective film to their products.